A family-owned winery that was located on the Silverado Trail in Calistoga, Napa Valley, founded in 1995, producing limited quantities of wines sourced from selected vineyards in California's North Coast counties. 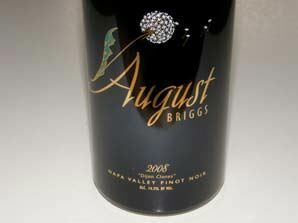 Owner August (Joe) Briggs brought over 25 years of winemaking knowledge to his label. Briggs was one of the few producers to craft a Pinot Meunier. Pinot Noirs were sourced from vineyards in Napa Valley, Carneros, Russian River Valley, and the Sonoma Coast. The excellent wines, about 4,000 cases annually of several varietals, were sold to a dedicated following. In 2011, August Briggs sold his namesake wine label to a partnership comprised of his nephew, winemaker Jesse Inman, and three, long-time winery employees, Colette Milliman, Matt Gacso and Lisa Salling. The new team assumed ownership of the brand and inventory, and is possibly the only employee-owned winery in California. The original 2-acre estate vineyard and winery was sold to Aubert. 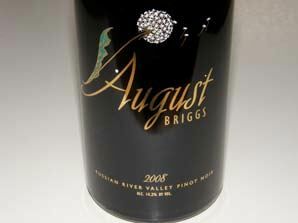 August Briggs Winery tasting room is now located in downtown Calistoga at 1307 Lincoln Ave.
Pinot Meunier is sourced from Frediani Vineyard in Calistoga. Pinot Noir is sourced from Sinskey and Green Island vineyards in Carneros, and Dutton, Archer and Cummings vineyards in Russian River Valley. August Briggs will continue his wine consulting business.